A hamper delivery of delectable treats, jars of pickles, bottle of wines, packs of tea and biscuits provides a festive treat for your dad on Father’s Day. If you want to spoil him with your time for the whole day, it is best to have something delectable to munch on and to feast on. For outdoor fun and picnic on Father’s Day, a gift of hamper that contains a complete set of BBQ grill and gourmets will surely amaze your dad. He can even set it up on his backyard if picnic outdoors is not possible. The florist has other sets of gourmets and marinades that can be used for backyard BBQ party. 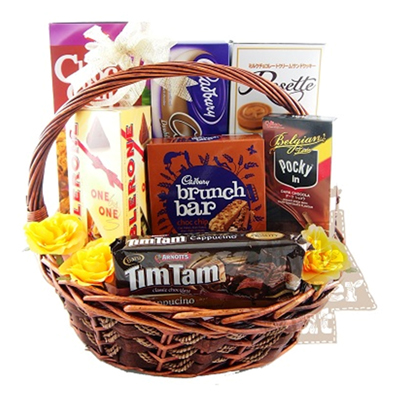 For a chocoholic dad, this chocolate hamper is prepared by the florist online to contain all kinds of chocolates from decadents to chocolate sauce to fudge mix, caramel chocolate bars, and yummy chocolate candies and cakes. Your dad will love to share this wonderful hamper of chocolates with everyone. From organic cheddar cheeses to vegan biscuits and cookies to fruit cakes and wheat breads, a healthy treat hamper will always be a winner to a father who is health-conscious. You can ask for a local flower delivery service to have this hamper delivered on the day of celebration, just in time for everyone to enjoy the treats while fresh. Your dad will surely love a hamper of spa-inspired products like body bath and lotion, body scrub, and soaps paired with relaxing bath salts and scented candles. The hamper may also contain a refreshing snack and wine and some candies and chocolates. These thoughtful hampers are gifts that your dad will never resist. If you want this special occasion to turn out to be one extraordinary special day for him, choose any one or two from these special hampers for the Father’s Day delivery.